New Installations: Whether you are building a new house, building an addition to your existing house or if your home doesn’t currently have a heating an air conditioning system, we can tailor a solution to fit your needs. Start-Ups: Once we complete the installation of a new system we assign a service technician to do the start up. 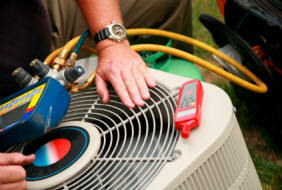 Many HVAC companies allow their installation teams to do the start up. We strongly believe that a service technician is best qualified to perform the start up during which he can also inspect the entire installation. Repair & Replacement: Our service technicians are highly skilled and know how to correctly troubleshoot your heating and air conditioning system. They aren’t paid commissions so your best interests are their only motivation. If a major repair is needed, we will give you all of the available options so that you can decide whether it is in your best interest to repair the equipment. Preventative Maintenance: Your systems Fall and Spring check-ups are important not only to maintain the energy efficiency of your equipment and prevent equipment failures, but also to make sure your equipment is operating safely so your family has peace of mind. The EPA Says: Dirt and neglect are the #1 causes of heating and cooling system failure. One of the most important steps you can take to prevent future problems and unwanted costs is proper maintenance. Keep your heating and cooling systems at peak performance by 1. cleaning or replacing the air filter about once a month, and 2. having a contractor do annual pre-season check-ups. Contractors get busy during summer and winter months, so it’s best to check the cooling system in the spring and the heating system in the fall.